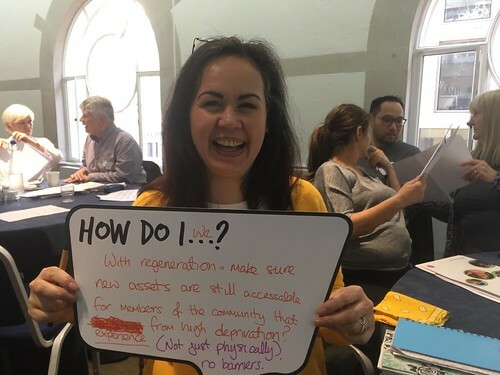 By Sarah Donohoe of National Association of Neighbourhood Management (NANM), with contributions from Jedidah Onchere from North Brixton, Tim Morton from St Matthew’s Estate and Carly Bond from Wormholt and White City as well as Peter Lewis from The Institute of Fundraising. In October representatives from twelve Big Local areas attended a learning and networking event in Milton Keynes hosted by Conniburrow Big Local partnership. We invited Peter Lewis from the Institute of Fundraising to give perspective on different sources of funding, and three Big Local areas to shared their experiences with fundraising. Peter Lewis’ main advice to Big Local areas looking to engage funders, was to take them on the journey with you. He suggested that funders are much less interested in what you do, but what you achieve by doing it – and why you do it. Rather than your activities, people will buy into your vision and your story about how you are getting there. Jedidah Onchere from North Brixton explained how their neighbourhood has received significant amounts of external funding to help their community with gang related violence, which has fractured the social landscape of North Brixton. However, this funding is often spent by outside organisations who are not rooted in the community. North Brixton are engaging with funders and demonstrating how the local community has the capacity to enact lasting social change. Their goal is to become constituted, so funding can flow directly into the local area. Tim Morton, rep for St Matthew’s Estate Big Local, attributed their success at securing funding from The Cruyff Foundation, Sport England and Samworth Bros Sports to a mixture of being recognised as a Charitable Incorporated Organisation (CIO) and their own clear vision. Their goal is to create a Multi-Use-Games-Area (MUGA), and Tim Mortan put forward the idea that their listing as a charity enabled St Matthew’s to open negotiations with the council for a 25-year lease for the land where MUGA is to be built. Wormholt & White City Big Local had their initial £1 million endowment matched by Hammersmith United Charities (HUC) at the beginning of their journey. HUC recognised the partnerships strong links within the community, and believed partnering with them could increase their local reach. Carly Bond, who works for Wormholt and White City Big Local, described how the relationship with HUC enriched the work of both partners, but also required a great deal of negotiation and relationship management. Carly suggested that any Big Local’s planning to bring in additional funding would benefit from learning these skills.